The Pre-Workout contains an advanced nutrient blend that naturally supplements athletic performance for more intense workouts. Take the Post-Workout within 20 minutes of completing a workout to supplement your body's natural recovery processes. 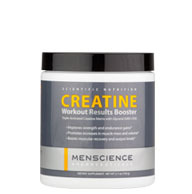 Add the Creatine Workout Results Booster to your routine to supplement muscles for better explosive power during aerobic and anaerobic workouts. Why do I need a pre-workout supplement? 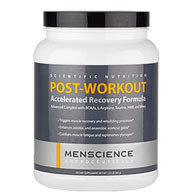 How does MenScience Pre-Workout Training Booster Formula differ from other pre-workout supplements? Can I take this during a workout? The ideal mix of nutrients in this men's pre-workout supplement prepare the body for intense exercise and help unleash your muscles' true potential. This pre-workout supplement for men contains only the essential ingredients. You won't find any filler in our products. As a result, this is the best pre-workout supplement for men you'll find. Aside from its purity, MenScience Pre-Workout Activator Formula contains critical nitric oxide activators like arginine and carnitine that work to significantly boost your efforts in the gym. Mix one packet of this pre-workout supplement in 6-8 oz. of cold water and drink 5-20 minutes before a workout. If you intend on exercising for a prolonged period of time (more than one hour), you can consume one more packet of MenScience Pre-Workout Training Booster Formula. For shorter workouts, water or a sports drink is enough. Yes, but it's not necessary. wow! this product has a great light orange taste, but more importantly, it really has helped me get a better workout, I have more energy and can definitively do more reps plus I don't get tired as fast. If you fell like you're not getting enought out of your workouts I recommend you this this drink. WOW!! This stuff is amazing! it is a great product to take before your workout ,,,, whiting a few minutes of taking it ,, i see the the effects of it.. I have more energy by lifting a heavy weight. Thie product has a nice orange taste. The most important is it really helped me to do my workout with great results. The energy I got is sufficient for the entire day! Really gets me primed before a workout! Add 1 packet to 6-8 oz. of cold water and mix well. Consume 5-20 minutes prior to exercise. 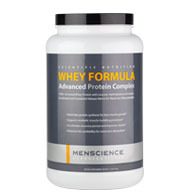 For maximum results, use as part of the MenScience Scientific Nutrition Program.